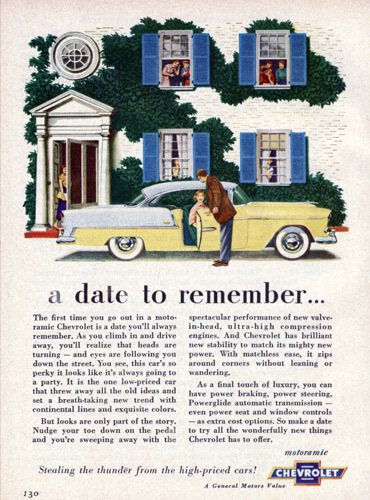 In 1953, Chevrolet Division knew they had a real winner on their hands with the new full size Chevy. Available for the first time in many years was an optional V8 engine for the family man on a budget. It was no longer going to be the preserve of the staid and wealthy. Then there's the car's styling; in one model year, the 1940s war time austerity was wiped clean off the slate. The fifties truly began mid way through the decade in spirit and it showed up in the Big Three's offerings. Ford and Chrysler were revealing some of their finest work that year as well. Chevrolet knew they had to really promote the car to get every sale possible. 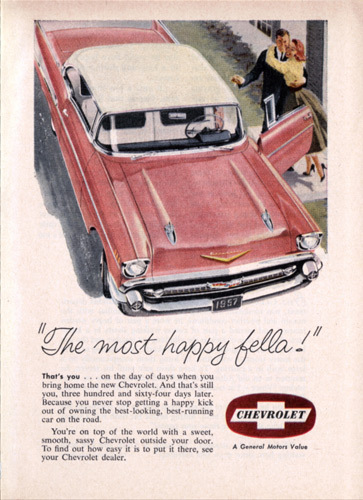 Towards that end, Chevrolet spent an unusual amount of money on ad campaigns for the line. What isn't well known is that the Canadian market tri-five Chevies had many differences in trim, colors and mechanical equipment from their American brethren. Canadian tri- fives were assembled in Oshawa, Ontario, and St. Therese, Quebec. If you bought an original Canadian Chevrolet you'd discover a classic car with charming details that stand out to the avid enthusiast, yet delivers the same essential free spirited motoring that made people worldwide fall in love with it. Let's take a look now at some of the Canadian variations. One trademark of Canadian GM ads is their standard tagline at the bottom of each ad, "A General Motors Value." This was a halo message promoting two important ideas. One was to buy Canadian and help your fellowman prosper; the other was emphasizing what a good deal a GM car was over the competition. At the time, McKinnon Industries supplied Canadian engines. Eventually, a series of plants spread across Canada making all sorts of parts for GM Canada cars. One example was 1901 Eglinton Ave. East in Scarborough, Ontario. It started making refrigerators in 1952, then switched to auto parts in 1960. Many AC Delco radios, horns and shock absorbers came from Scarborough during the 1960s and early 1970s. It became a GM van plant from 1974 'til closing. 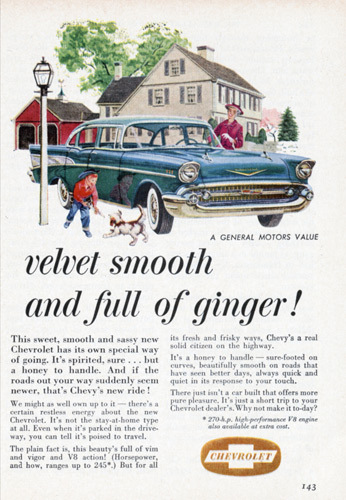 We'll start with the color palette ad featuring 1955 Chevrolets. This ad is interesting because Canadian Chevys had unique colors unavailable in the States. Some of the names were changed for US colors used on Canadian cars and sometimes the paint mix was different. 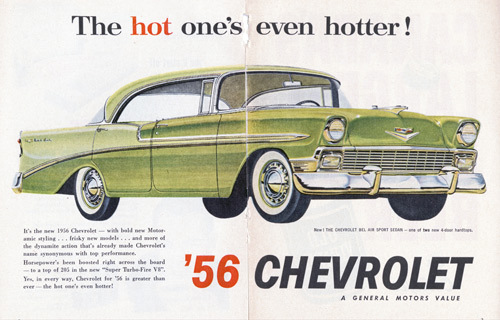 Canadian assembled Chevys were sprayed in enamel, not nitrocellulose lacquer. A good example of a Canadian color variation of US paint is this 1956 two page ad promoting a Bel Air V8 sport sedan in two tone Laurel Green and Crocus Yellow. In Canada, Crocus Yellow has a greenish tinge that US cars don't have. This Canadian ad shows the difference clearly. Canadian Crocus Yellow has more green than the American paint mix, it's a notably different variation of an American paint color. Another example of a Canadian only color Chevrolet is this fine 1957 Bel Air V8 sport hardtop. This two tone beauty is wearing Dover White over Dusky Rose. Dusky Rose is a metallic hue best described as metallic rose pink. The closest shade to it on US cars would be Dusk Pearl which is much darker. It should be noted that Dover White is a Canadian paint mix which is a bit lighter than India Ivory. It's a sad fact that many Canadian tri-five Chevies have been restored using US paint codes, losing the unique color difference by substituting India Ivory over Dover White. Dusky Rose is a Canadian only color with no US match. It is shown on this 57 Bel Air with Dover White two tone combination. 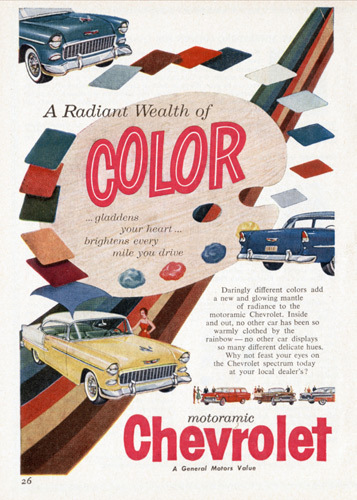 Canadian ad depicts some of the unique colors available including Matador Red as shown on the station wagon above " Motoramic" tagline. Canadian Matador Red is very close to the American shade. Only a survivor car would demonstrate the difference in hue. Sometimes a rare combination shows up which only looks a little different. An example is the classic Harvest Gold mixed with Greystone White instead of India Ivory. Greystone White is your classic baked enamel refrigerator hue. It was dropped about half way through 1955 for Dover White which is only a little brighter than India Ivory. In Canada, Dover White substituted in two tone applications for India Ivory. Any surviving Greystone White Chevies are very scarce now. Greystone White was pure white like a baked enamel refrigerator and was used on two tone 1955 cars like this Bel Air hardtop. Dover White is closer to India Ivory, but is lighter than the American version. It wasn't just paint that made these cars different. Canadian tri-five Chevrolets used V8 engines cast and assembled at the McKinnon Foundry in St Catherines, Ontario. They also used Canadian generators, starters, exhaust manifolds, radios, radiators, clocks, shock absorbers and horns. The horns were flatter than the US versions and were stamped "Autolite". Another Canadian oddity was the 150 model came with side trim in 1955 while the US model did not. The 1956 radio antenna mast had an arrowhead tip; the US model did not. In 1957 the Canadian Chevy used one piece bumpers whereas only the California assembled Chevies in America used those valued stampings. This fact is corroborated in the ad showing a Haven Blue Metallic '57 Bel Air four door sedan with the one piece bumper Haven Blue Metallic was the Canadian sales name for Harbor Blue. All Canadian frames were all multi piece welded units. Only American cars used the one piece frames and even then they weren't common. One last big item was the glass. The Canadian cars used Shade-Lite tinted glass. This 57 Bel Air sedan illustrates use of the one piece bumpers on all Canadian 57s. Only California assembled Chevys used them in America. Also note as in the Dusky Rose/Dover White car, this Bel Air has metal bumper caps instead of black rubber bullets as standard practice on all Canadian models. There are a number of small details which only show up during a full scale concours restoration. When a car is going for factory original appearance, the details add up. When restoring a generator from a Canadian Chevrolet, it isn't good enough to use an American housing and recondition it. The Canadian generator housing is longer and has its own green tags instead of the familiar red Delco Remy tags from Anderson, Indiana. Likewise, the wiring on the horns differ from US models. 1955 Canadian horn wires are coded for ground with a white stripe; the US horn wires are black on both circuits. The door handles on a '55 differ from the US model by contour. They used different suppliers. The same situation occurs with the antenna base and hood bird ornaments. This is a fair but no means complete summary of the differences noted between the Canadian market and American Chevrolets. We hope you've enjoyed it and gained an appreciation of the subtle differences between the two classics from the pre Auto Pact era.